International Journal of Nanomedicine paper accepted! Congrats! The manuscript "Doxorubicin-Loaded Protease-Activated NIR Fluorescent Polymeric Nanoparticles for Imaging and Therapy of Cancer" by Tugba Yildiz, Renpeng Gu, Stefan Zauscher, and Tania Betancourt* has been accepted for publication in the "International Journal of Nanomedicine." Here a link to a nice paper (unpublished) on the Statistical Analysis of Single-Molecule AFM Force Spectroscopy Curves. The work arose from a collaboration between our and Prof. Scott Schmidler's group at Duke. Scott is the corresponding author on the statistical methods part. Congrats Renpeng! The paper "Enzymatic synthesis of nucleobase-modified single-stranded DNA offers tunable resistance to nuclease degradation," was just published in Biomacromolecules. Congrats Luis and Dan! The Biconjugate Chemistry Paper is published. "Synthesis of Modular Brush Polymer-Protein Hybrids using Diazotransfer and Copper Click Chemistry"
Controlled Release Paper just Published! Our paper entitled "Encapsulation and controlled release of retinol from silicone particles for topical delivery," was just published on-line in the Journal of Controlled Release! Congratulations to your successful defense and MS thesis entitled "Microphase Separation of Stimulus-Responsive Block-co-Polypeptides on Surfaces." Congratulations to a successful PhD defense, and your dissertation entitled "Synthesis and Self-assembly of Amphiphilic DNA Copolymers." Congratulations to Kate Marusak for her successful defense of her dissertation! Well done Kate! Luis just passed his preliminary exam "Bioinspired Lubricants for the Treatment of Osteoarthritis". Well done! Our collaborative paper entitled "Programmable assembly of pressure sensors using pattern-forming bacteria" was published in Nature Biotech. Congratulations to Zehra for winning an NSF STTR and read the story about her startup company Qatch! What a Qatch! Model cell membranes: Techniques to form complex biomimetic supported lipid bilayers via vesicle fusion, published in 2013 is one of the most highly cited papers in Current Opinion in Colloid & Interface Science during 2014, 2015 and up until June 2016. Congratulations to Dr. Lei Tang for a Successful PhD Defense! Lei Tang defended her PhD dissertation entitled: “Enzymatic Polymerization of High Molecular Weight DNA” with flying colors. Congratulations! 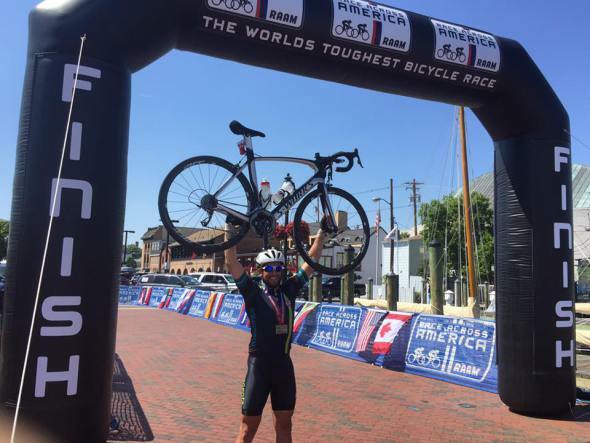 Rob Ferris (former Zauscherlab Grad Student) places 5th in Solo RAAM! Congratulations Rob! Truly an amazing achievement! RT-MRSEC and Zauscher Win Dean’s Award for Inclusive Excellence in Graduate Education!